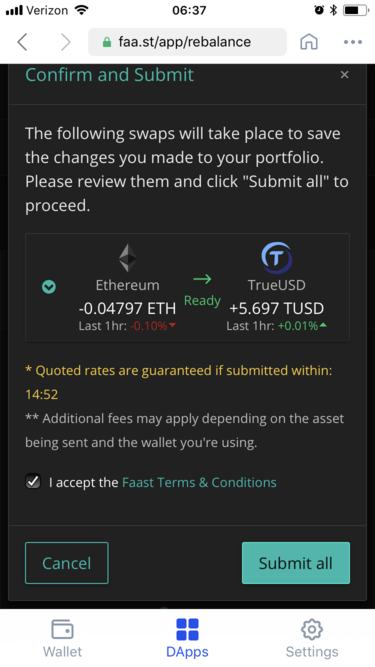 Today we are proud to announce that Faast is now integrated with Coinbase Wallet! Mobile wallets are an increasingly important to bring your crypto assets with you wherever you go. 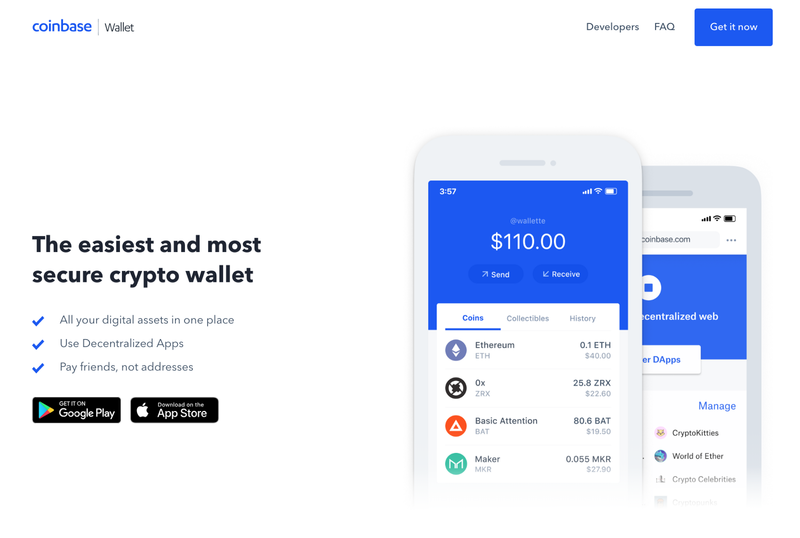 Formerly known as Toshi Wallet, Coinbase’s wallet has quickly established itself as one of the best ethereum mobile wallets on the market. We’ve added support for many great wallets in recent months, and given its popularity, we knew it was only a matter of time before we’d be adding support for Coinbase wallet. In this article, you’ll learn how to connect your Coinbase Wallet to Faast, and start swapping cryptocurrencies right on your own smartphone. Coinbase Wallet is designed for EC20 tokens, so you’ll only be able to store and swap tokens built on the Ethereum blockchain for now. (Coinbase does state they are working on adding BTC, BCH and LTC support, but for now, it’s strictly tokens). 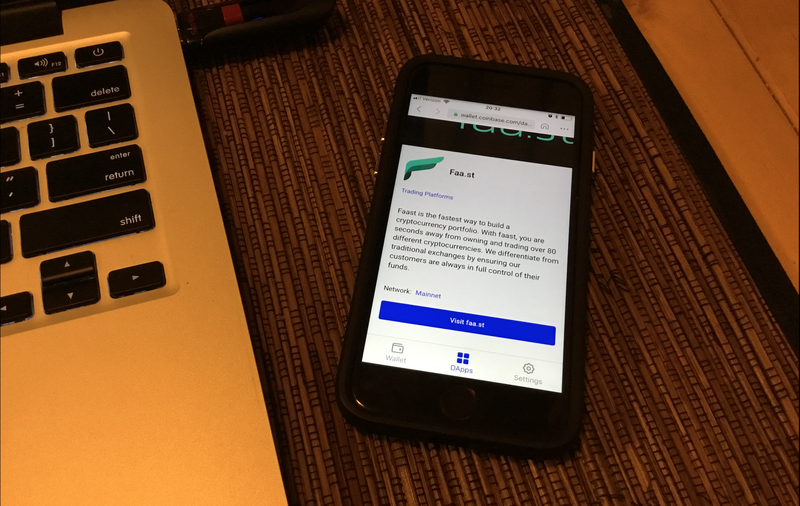 If you haven’t already done so, you’ll need to install the app and create a user account before you can access Faast. 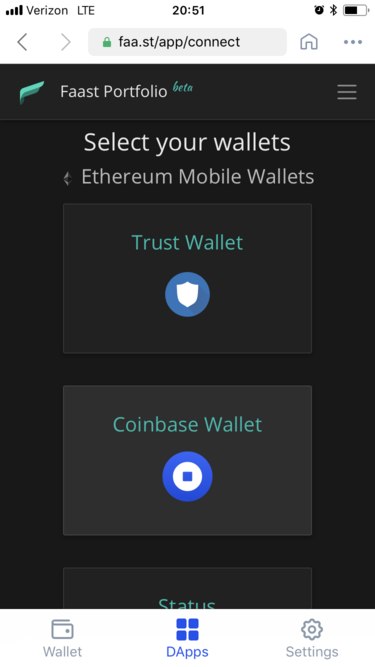 Go to https://wallet.coinbase.com/ and choose from the Android and iOS options. This will take you to the app download page in the App Store or Google Play. (In this article, we’ll be using screenshots from the iOS version). Here’s a quick step-by-step video to get your wallet set up in minutes. Open up your Coinbase Wallet app and enter your password. You’ll be taken to the main screen which displays your balances. 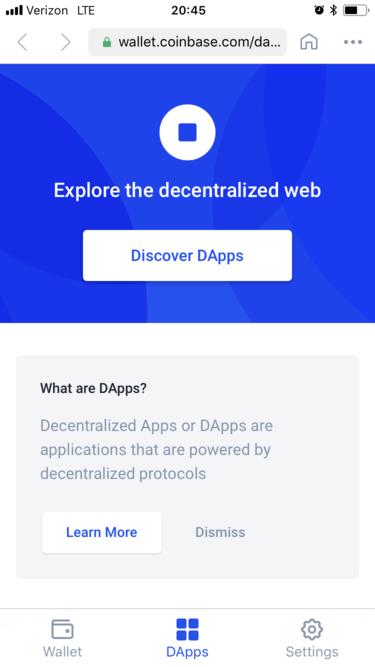 Press the “DApps” icon in the bottom center of the screen. 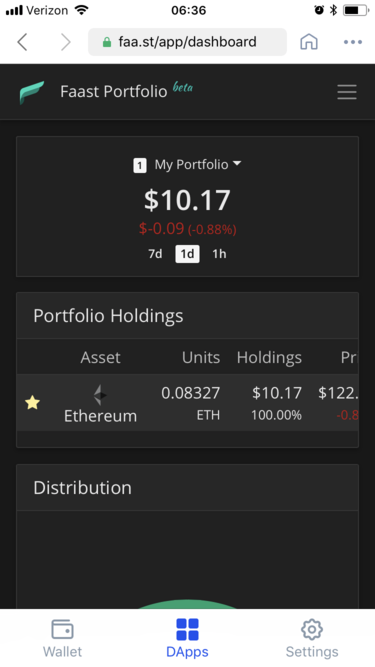 From here you’ll see a button saying “Discover DApps”, along with some featured ones. Select the button to proceed. The available DApps will be separated by category. Choose “Show All” under the Trading Platforms category— it should be the first option. 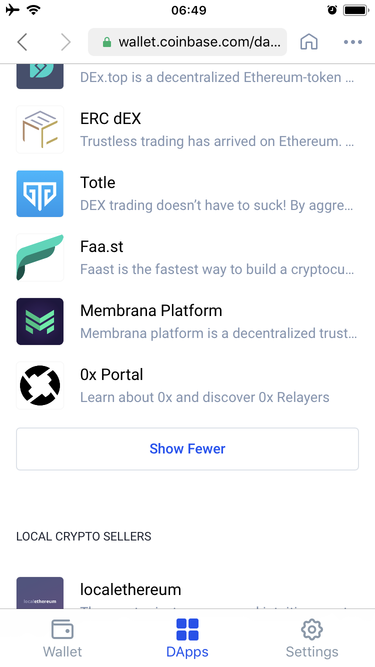 Scroll down and you will see Faast listed in the DApps! Select Faast. Here you’ll see a brief description of the product, along with a link at the bottom. Press “Visit faa.st”. 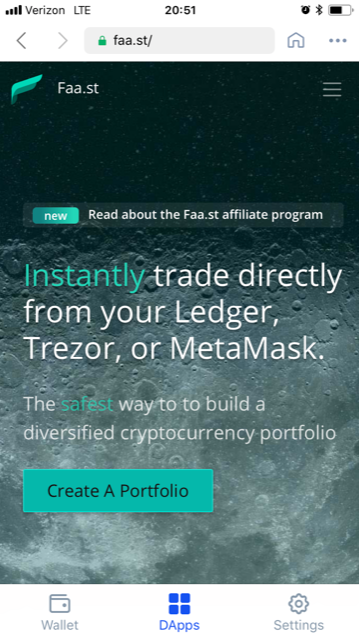 A mobile-friendly version of the Faast website will now appear in the Coinbase Wallet browser. Press the menu icon in the upper right corner and the menu options will drop down. Select “Portfolio”. Here you’ll see a list of the mobile Ethereum wallets Faast is compatible with. Choose Coinbase Wallet. You’ll now be taken to the screen showing your portfolio! Click the tab in the upper right corner to access the drop down menu. To add new assets to your Coinbase Wallet, select “Assets”. 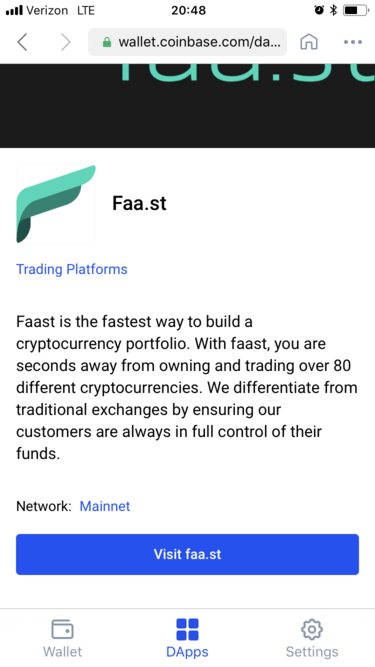 And there you have it, You’re now ready to begin swapping cryptocurrencies with Faast!At this time, the Faast DApp supports 80 different digital assets through Coinbase Wallet.